Not many people can say that they have a tunnel named after them. Chris Pape aka Freedom aka Gen II can say that. 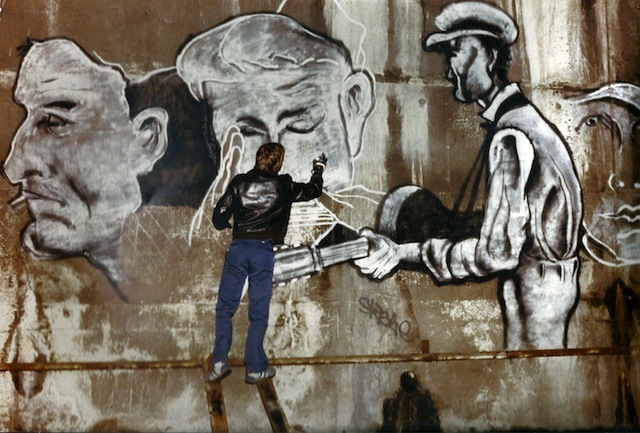 He painted what is now known as the Freedom Tunnel between 1980 and 1996. 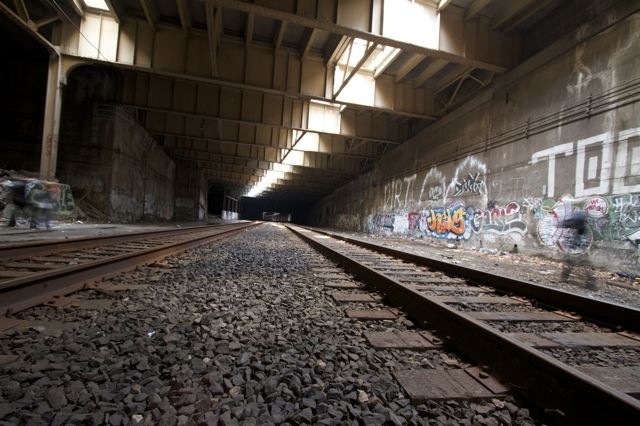 Over the last few decades, this tunnel underneath the Upper West Side of New York City has become an icon for the urban exploring and graffiti communities. While graffiti has always been influenced by other art movements, Freedom made this more evident that most writers by skillfully recreating and explicitly referencing great art throughout history (from Renaissance art to pop art). Over the years, he turned the tunnel into his own personal hall of fame. Since Freedom has a show on online at Dirty Pilot and he’ll be signing books this weekend at the NY Art Book Fair, it seemed like a particularly good time to speak with Freedom about his work, as well as his thoughts on graffiti and art in general. RJ: Freedom is one of my all-time favorite artist pseudonyms. Where did the name come from? What does it mean to you? Chris Pape: I wish I had a great story as to how I got the name but I don’t. What I can say is that when I returned to writing in 1979 I didn’t want to be GEN 2 anymore, that name held no weight to it and was more about being a teenager, FREEDOM was more message oriented. What inspired you to go from writing graffiti on trains to painting non-letter based work in a relatively private environment? I wasn’t a very good graffiti artist, I didn’t steal paint and that meant I was never going to king anything. I used a lot of silver and black because you could stretch it. I began doing tonal work on the sides of trains and realized I could draw with paint, this was still while doing letters. I began doing portraits in the park above the Freedom Tunnel which were pretty bad. One day coming out of the park I looked through the grating above and realized that that was the place for the paintings, that the early works were monochromatic was a fluke, it just happened that the walls were too porous for color – the idea of priming a wall had never occurred to me. I’ve asked writers the difference between street art and graffiti, and my favorite answer is that graffiti is a sport and street art is art. While I don’t think these two categories are mutually exclusive, it seems like you moved more towards the street art side of that definition once you began painting in the tunnel. How did you think about your work in the tunnel? Did you view it as graffiti, something closer to what would now be called street art or something else entirely? It is weird that I ended up in the street art world, I had a very graffiti centric mentality. 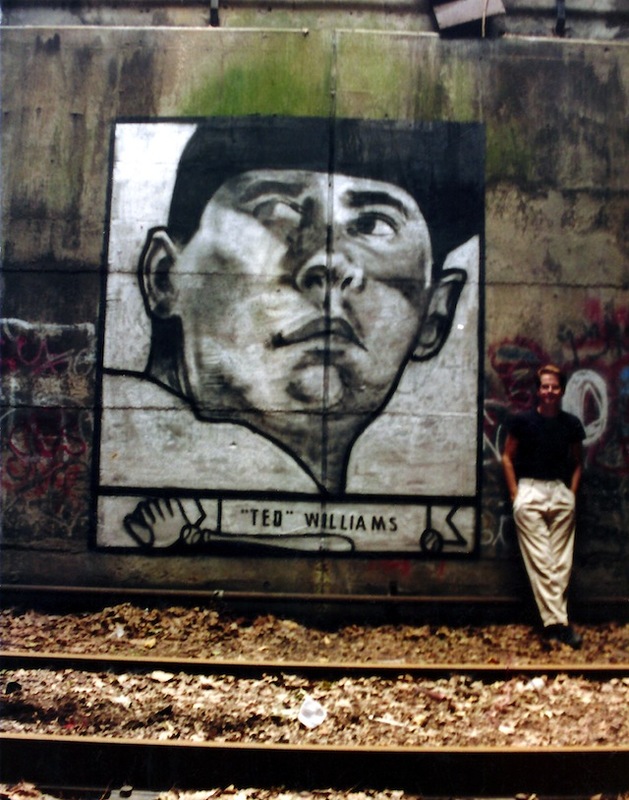 While I was around the early street art movement ie: Fekner, Ahearn and Haring I always considered myself a writer – still do. Most people probably don’t realize that Freedom and GenII are the same person. How and why do you separate your identities of Freedom, the tunnel painter; Freedom/Chris Pape, the gallery artist; and GenII, the graffiti writer? I think that you think I’m the new GEN 2 who has gotten up extensively – that’s not me. At the age of 14 and 15 I wrote the name GEN 2 on the streets of Manhattan and Queens, I wasn’t up much because of my age, but it was a nice introduction to the graff world. While painting in the tunnel I would like to say that I took a lot more chances, there was absolutely nothing at stake, few people knew the works were there and they had no intrinsic value, I could fail consistently and did – if I was lucky I made art. OF course you could easily argue that the failures are art as well because without them I wouldn’t have gotten to the next level. As a gallery artist I’m more conservative. I have a responsibility to the gallery to include a few images that I know will sell, out of 10 paintings 2 of them will be proven winners, the other 8 are where I get to take risks. I can live with that percentage for now. Yep. My mistake about confusing two different Gen II’s. Sorry. 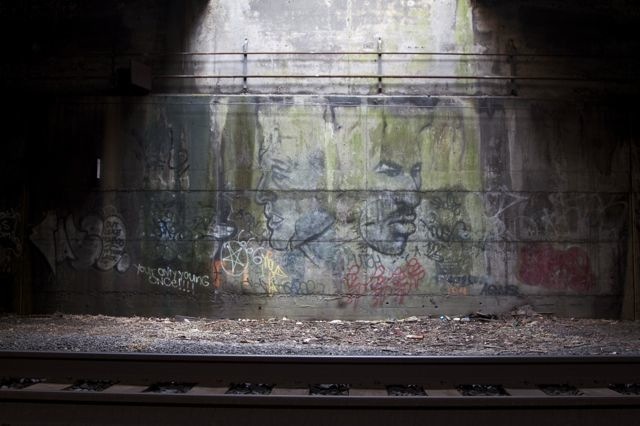 When Amtrak reopened the tunnel in the 1990’s, your art became linked in the minds of the public with the men and women living there who were kicked out. How would you describe the relationship between yourself, your art and the people living near it? Luckily for me I was there first, I started in 1980, the homeless that I knew moved in in 1986. They had a natural curiosity of me and my paintings and we eventually became quite close. Early on I would only go in the tunnel if I was going to paint, by the late 80’s I was there hanging out and documenting the people. Towards the end I was involved in getting some of the people out. I would call them friends. How did going to the La Guardia High School of Music and Art impact your graffiti? It ended my days as a teenage graffiti writer. I was writing because of the urban competition part, I loved that. At LaGuardia the talent was limitless and you could draw with your friends all day – that’s where all of my energy went. 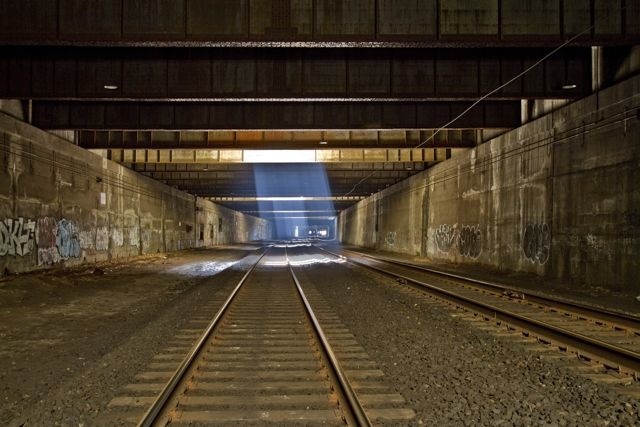 What was it like to revisit the tunnel recently with The New York Times? I felt old because I had a problem getting over a fence that I used to be able to leap over – it’s been 11 years. I still love the environment but once they sealed the whole thing off and got rid of the homeless it was time to go. I left on a high point. I’ve heard it said that, when graffiti moves indoors, it is a still life. How have you transitioned your art to an indoor setting? It wasn’t easy. When I started in the tunnel I was 19 years old and homeless. By the time I left I was 35, had an apartment and a degree in visual journalism from the School of Visual Arts, I knew how to paint and draw and had a criteria for what I believed art was. I had a series of images to paint – that’s the good news. Everything I’ve done based on the tunnel works are diluted. Once you’ve reconciled yourself to that it becomes liberating because your no longer tied into the exact image in the tunnel, or the textures or the lighting etc. That feeling of liberation allows you to go down different paths and explore earlier ideas in a different way. They’re two separate experiences. The key thing is knowing that their two separate animals, that took a long time for me to figure out. You’ve been involved in several cycles of graffiti’s waxing and waning popularity in galleries. What do you think about the art market’s influence on graffiti? It’s a larger question about money. A booming economy drove the art market in the 80’s which allowed for a larger amount of galleries and a new client base looking to get rich off the next Haring or Basquiat. When the crash came in 1987 the galleries closed and the client base dried up, everyone got hit across the board. 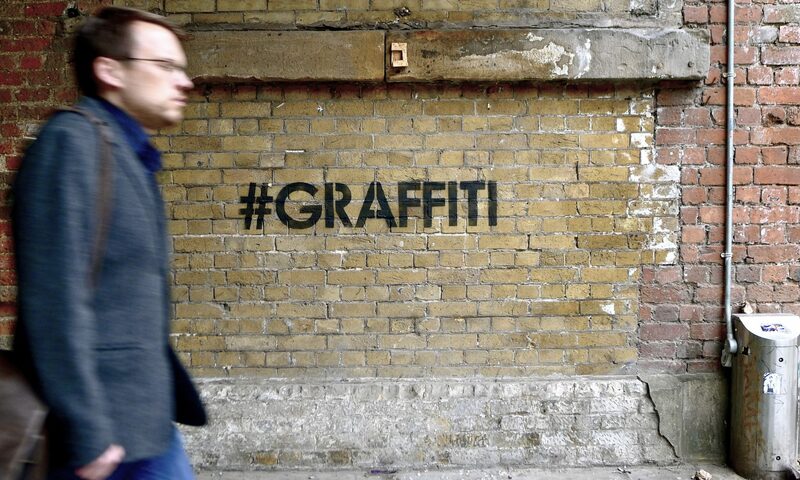 Graffiti’s success in the galleries today is tied in with the larger success of street art and Banksy in particular. It’s happening during a bad economy which bodes well for the artists involved. Having said that, I don’t think the art world has any impact on real writers. Do you see any moral issues about selling artwork in galleries based on your graffiti art that is linked to a disenfranchised homeless population? None whatsoever. 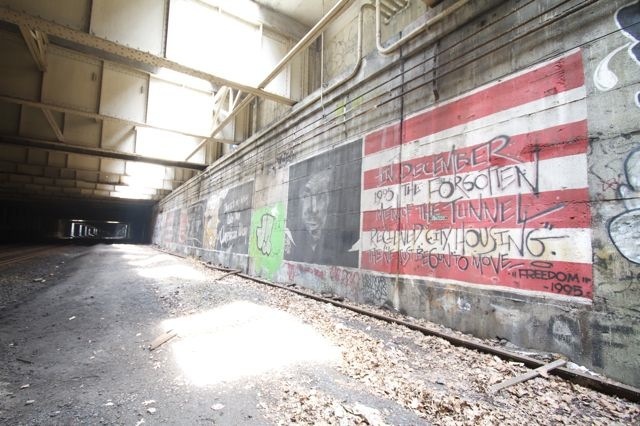 Having said that, there are 3 different portraits of the homeless on the walls of the tunnel, two have been transferred to canvas, nobody wants them. Even if I felt I were dealing in a grey area morally and decided to give 50 percent of the earnings from the canvasses to Bob and Bernard (the models for the paintings), I can tell you that people don’t want to look at homeless people. They don’t want to see them on the street and they certainly don’t want them on their wall. 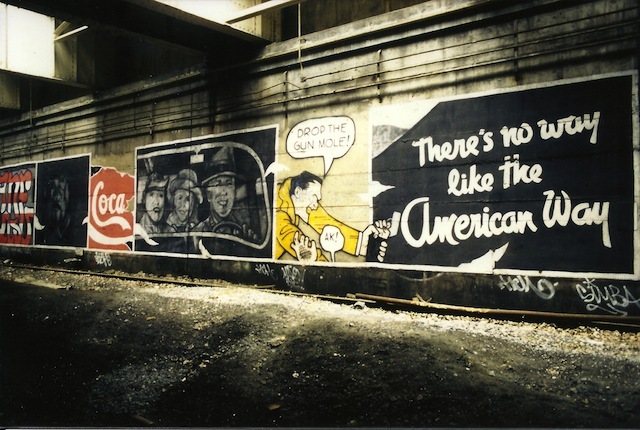 Murals by Freedom, photo circa 2011. Photo by an urban explorer. What is your relationship like today with graffiti, both old and new? I have a very small relationship with new graffiti, it is a fault of mine. To me there is only the train era from 1969 to 1989. I’m at the point where I’m done archiving my collection, lately I’ve ben trying to get writers to talk about their trains and what they remember about specific events. I have another biography of a famous graffiti writer almost finished. I have a sketchbook being published. And the documentary Wall Writers should be coming out. I’m proud of all three projects. I also plan to sleep a lot.